Who is the GovRAT Author and Mirai Botmaster ‘Bestbuy’? In February 2017, authorities in the United Kingdom arrested a 29-year-old U.K. man on suspicion of knocking more than 900,000 Germans offline in an attack tied to Mirai, a malware strain that enslaves Internet of Things (IoT) devices like security cameras and Internet routers for use in large-scale cyberattacks. Investigators haven’t yet released the man’s name, but news reports suggest he may be better known by the hacker handle “Bestbuy.” This post will follow a trail of clues back to one likely real-life identity of Bestbuy. At the end of November 2016, a modified version of Mirai began spreading across the networks of German ISP Deutsche Telekom. This version of the Mirai worm spread so quickly that the very act of scanning for new infectable hosts overwhelmed the devices doing the scanning, causing outages for more than 900,000 customers. The same botnet had previously been tied to attacks on U.K. broadband providers Post Office and Talk Talk. Security firm Tripwire published a writeup on that failed Mirai attack, noting that the domain names tied to servers used to coordinate the activities of the botnet were registered variously to a “Peter Parker” and “Spider man,” and to a street address in Israel (27 Hofit St). We’ll come back to Spider Man in a moment. 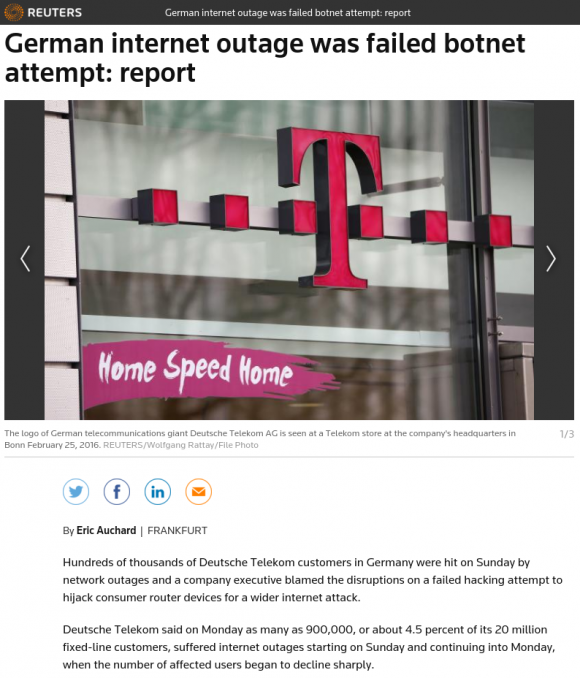 According to multiple security firms, the Mirai botnet responsible for the Deutsche Telekom outage was controlled via servers at the Internet address 62.113.238.138. Farsight Security, a company that maps which domain names are tied to which Internet addresses over time, reports that this address has hosted just nine domains. The only one of those domains that is not related to Mirai is dyndn-web[dot]com, which according to a 2015 report from BlueCoat (now Symantec) was a domain tied to the use and sale of a keystroke logging remote access trojan (RAT) called “GovRAT.” The trojan is documented to have been used in numerous cyber espionage campaigns against governments, financial institutions, defense contractors and more than 100 corporations. Another report on GovRAT — this one from security firm InfoArmor — shows that the GovRAT malware was sold on Dark Web cybercrime forums by a hacker or hackers who went by the nicknames BestBuy and “Popopret” (some experts believe these were just two different identities managed by the same cybercriminal). 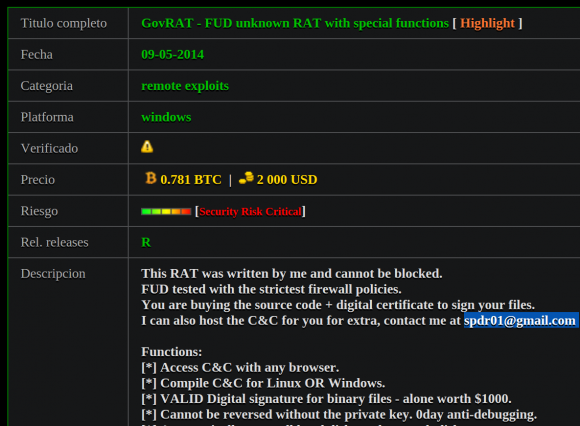 The hacker “bestbuy” selling his GovRAT trojan on the dark web forum “Hell.” Image: InfoArmor. GovRAT has been for sale on various other malware and exploit-related sites since at least 2014. On oday[dot]today, for example, GovRAT was sold by a user who picked the nickname Spdr, and who used the email address spdr01@gmail.com. Recall that the domains used to control the Mirai botnet that hit Deutsche Telekom all had some form of Spider Man in the domain registration records. Also, recall that the controller used to manage the GovRAT trojan and that Mirai botnet were both at one time hosted on the same server with just a handful of other (Mirai-related) domains. According to a separate report (PDF) from InfoArmor, GovRAT also was sold alongside a service that allows anyone to digitally sign their malware using code-signing certificates stolen from legitimate companies. InfoArmor said the digital signature it found related to the service was issued to an open source developer Singh Aditya, using the email address parkajackets@gmail.com. Interestingly, both of these email addresses — parkajackets@gmail.com and spdr01@gmail.com — were connected to similarly-named user accounts at vDOS, for years the largest DDoS-for-hire service (that is, until KrebsOnSecurity last fall outed its proprietors as two 18-year-old Israeli men). Last summer vDOS got massively hacked, and a copy of its user and payments databases was shared with this author and with U.S. federal law enforcement agencies. The leaked database shows that both of those email addresses are tied to accounts on vDOS named “bestbuy” (bestbuy and bestbuy2). The leaked vDOS database also contained detailed records of the Internet addresses that vDOS customers used to log in to the attack-for-hire service. Those logs show that the bestbuy and bestbuy2 accounts logged in repeatedly from several different IP addresses in the United Kingdom and in Hong Kong. The technical support logs from vDOS indicate that the reason the vDOS database shows two different accounts named “bestbuy” is the vDOS administrators banned the original “bestbuy” account after it was seen logged into the account from both the UK and Hong Kong. Bestbuy’s pleas to the vDOS administrators that he was not sharing the account and that the odd activity could be explained by his recent trip to Hong Kong did not move them to refund his money or reactivate his original account. A number of clues in the data above suggest that the person responsible for both this Mirai botnet and GovRAT had ties to Israel. For one thing, the email address spdr01@gmail.com was used to register at least three domain names, all of which are tied back to a large family in Israel. What’s more, in several dark web postings, Bestbuy can be seen asking if anyone has any “weed for sale in Israel,” noting that he doesn’t want to risk receiving drugs in the mail.